Okay... if you aren't a dog lover, you aren't going to drool over our tail wagging wedding ideas for pooches, BUT ... for those of us who LOVE our slobbering pooches, share our beds with these furry "babies", and wouldn't even THINK about getting married without our best canine friend by our side, READ ON! At Where Brides Go (TM), we LOVE all dogs (but we're a little partial to Basset Hounds) and we have some fun ideas for including "Fido" in your festivities. 1. Include "Fido" in your engagement photos and hand out wallet size copies during your reception as wedding favors. 3. If your wedding venue won't allow your pet inside, you can still include your pet as part of the ceremony. Have your officiate work in a cute story that illustrates how you two share a love of dogs. 4. 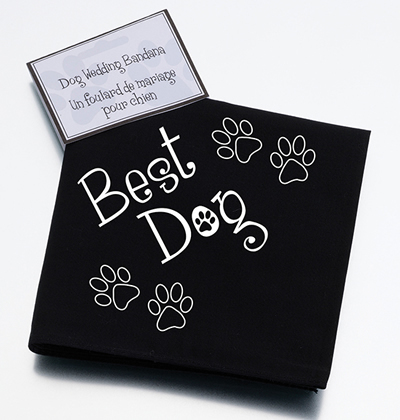 Add a tribute to "Fido" in your wedding program. 5. 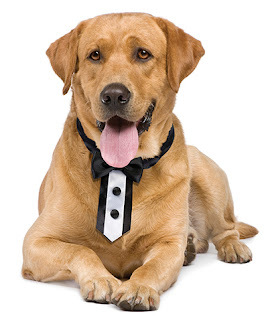 If your venue allows, have "Fido" as a groomsman or "Fidette" as a bridesmaid. Do make sure you have a human bridal party member in charge of making sure your baby has piddled outside before walking down the aisle. 6. 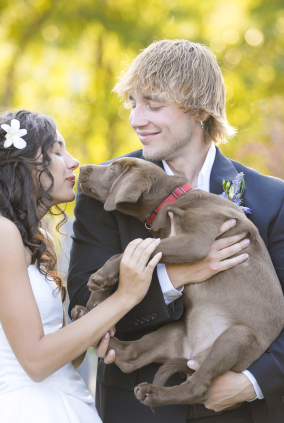 At an outdoor wedding ceremony, you can have Fido stand in as the ring bearer or flower dog! As always, appropriate wedding attire and doggy wedding accessories are a must! 7. For an outdoor wedding reception, just about anything goes. Invite "Fido" as a special guest and have his date be the hired dog walker (don't leave out this part ... you'll want to make sure someone else is attending to your pooch so you can enjoy the eve). While including your "baby" in the big day is a no-brainer to you, do keep in mind that not everyone is going to agree. You should check and double-check with your ceremony venue, reception venue, officiate, and bridal party to ensure no one has an issue with your canine participant. Be mindful that some of your guests may have extreme pet allergies and may not even be able to attend if "Fido" is on hand. Consider announcing your plan to include your pet on your wedding website so your guests will know in advance. You should also make an honest assessment of your dog's behavior and coping skills. If "Fido" isn't extremely well-behaved, well-trained, used to large crowds, and a relative non-barker, you should consider leaving him at home for the actual ceremony/reception and only involving him in engagement photos and pre-wedding festivities. After all, if your "baby" is stressed out and acting up, it won't be a pleasant experience for anyone. No one loves dogs more that we do ... in the end, you want a happy and memorable day with your family and best friends by your side. If "Fido" fits the bill and is up to the challenge, go for it. Woof! Shop for Pet Wedding Supplies at WhereBridesGo.com! Where brides go® ... for what brides love! For a great selection of affordable wedding supplies,wedding accessories, and wedding cake tops, check out WhereBridesGo.com!